PHOTO COURTESY: MICHAEL CLARK - Jasper Stites and Ella Ferguson practice welding during a plumbing trades tour. Oregon City Service Learning Academy (OSCLA), reached out to leaders in various trade industries. Her goal was to create a network of industry partners that would be willing to provide in-depth, interactive and hands-on learning opportunities for students, and the Trade Tours program was born. Every Friday, all students at OCSLA are exposed to various service learning opportunities. Trade Tours are scheduled February through April and include a total of nine separate off-site trips. Each visit includes a class lecture and hands-on learning opportunity that lasts for at least an hour. Through the tours, students visit and learn from area electricians, insulators, plumbers, tree trimmers, masons and carpenters. Since these tours offer a wide array of trades, the students are able to learn whether any of them spark an interest, or if they could see themselves performing the jobs in the future. 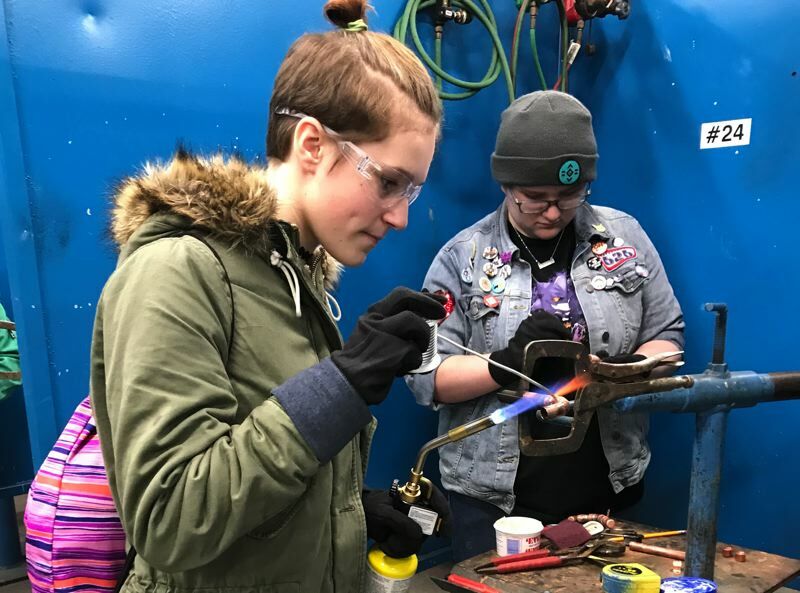 "I've liked the plumbing the best because welding things makes more sense to me than wiring circuits, and I'm not interested in climbing trees," said Ellie Blythe, a freshman. "These trips have been so cool. Everyone says you should go to college, but this has opened my eyes to other options. Other schools don't have opportunities like this. The trades are really cool, and you can make good money not sitting at a desk," said MJ Albers, a sophomore. The program has been a big success for the students, as well as the experts in the trades who have a high demand for the next generation of trade workers. "This program and these tours are great at showing students the great jobs that are available to those who are interested in the trades," said Bethany Taft, a teacher at OCSLA. "Many of the trade industries greatly need additional skilled workers and the wonderful students from OCSLA could be the perfect fit for many of these jobs." For families interested in learning more about OSCLA, a 6 p.m. open house is scheduled for Wednesday, April 25, at 995 South End Road, Oregon City. Call the school at 503-785-8250 to RSVP.